Everyone is welcome at Abbey Church. We are a group of people from various backgrounds, all ages, who want to follow Jesus Christ in our daily lives as we seek to ‘make Jesus known’. 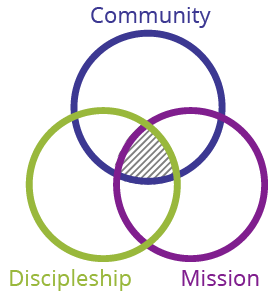 To help us understand and apply what that means we use the three interlocking circles of Community, Discipleship and Mission (CDM). Discipleship: Followers and learners of Jesus who want to live as the Bible teaches for our joy and God’s glory. By ‘independent’ we mean we are not part of any denomination, although we actively seek to work with all other local churches. We participate in various Christian initiatives including Gloucester City Mission, the World Café for refugees and other cross-city youth activities. We are also a member of Partnership that provides a supportive network for like-minded independent churches by providing resources, training and consultancy. By ‘evangelical’ we mean that we are passionate about God, the Bible and about the Church. The Bible is the Word of God and in it we have the ‘good news’ that through His Son, Jesus Christ, we can come into relationship with God and be joined to His Church. We want other people to know that. Abbey Church was formed in 1999, when a group of Christians from Hillview Church, Hucclecote, wanted to plant a church on the newly built housing estates of Abbeydale and Abbeymead. Since then we have met on Sunday mornings in Heron School, which provides space that fits our activities for all ages. Everyone is welcome at Abbey. Our hope is that is that we will all come to recognise God’s love for us in Jesus Christ and in response want to express our worship to Him in our love and commitment to one another. It is a great privilege and joy to be part of the church family at Abbey, a local expression of the one, worldwide, Church of Jesus Christ.